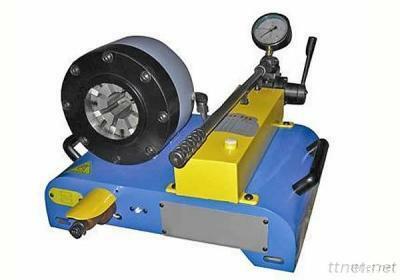 Also named hand operated hose crimping machine and hand driven hose crimping machine, this kind of hose crimping machine has the same light advantage with mini automatic hydraulic hose crimping machine. Because of this feature it can be carried to the job sites. Not only can it be used in plain areas but also can be used in rugged terrain. In addition the equipment is the ideal device for areas where electric power is not available or cannot be used for safety reasons. There are three kinds of manual hose crimping machines produced by us, namely 3 inch hose crimping machine and two types of 1-1/4 inch hose crimping machines.